The Moulin Rouge! actress was born in Hawaii to Australian parents, and given the moniker Hokulani, which means "heavenly star". And Keith loves her alternative name so much that he got it permanently etched on his chest, to go with the tattoo he already has bearing her name surrounded by a tribal design on his right bicep. 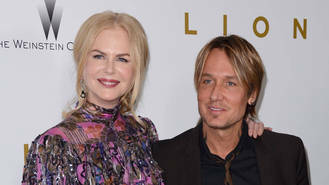 "My husband (Keith Urban) has the name tattooed over his heart," she revealed to U.K. chat show host Graham Norton while talking about her other name during a new interview. Keith has plenty of tattoos on his body, and his collection reportedly includes another one dedicated to Nicole on his right wrist which features her initials NMK within a Celtic symbol. He previously explained the tribute was actually a cover up for an older tattoo that read "Omnia Vincit Amor," Latin for "Love Conquers All," which he got while in a previous relationship with supermodel Niki Taylor, who got the same. Keith, 49, met Nicole in 2005, they got married in 2006 and have two daughters; Sunday Rose, eight, and Faith Margaret, who turns six later this month (Dec16). The actress, also 49, had previously revealed to InStyle magazine in 2014 that Keith often calls her Hokulani at home. "My mum called me Hokulani. It means heavenly star," she said. "That's something no one really knows. Well, Keith knows it. He calls me Hokulani sometimes.